It is increasingly evident that Eliot is not only autistic, but is also an uncommon girl. Eliot’s mother, Carla, recounts their journey down an unfamiliar path riddled with dismissive medical consultations and mental health referrals to clinics with epic waiting lists. Eliot transitions to Ella, with ambitions of being a trophy wife. Her parents attempt to set limits but Ella, in a typically teenage way, resists anything she deems as trying to squelch her true feminine self. Ella is “outed” repeatedly by teachers she trusted and stops attending school. Carla’s rage morphs into a motivating sense of injustice and she engages in a successful campaign for her child’s civil rights. Carla and Ella are not superheroes, they are just a couple of uncommon girls determined to leave a bumpy road a little smoother for the next travelers. Carla Grant is a non-compliant pharmacist, exceptional post-secondary educator, author, photographer, and overachieving mother. She was born and raised in Canada, where she attended the University of Alberta. She is a study in contrast—valedictorian at eighteen, recipient of the New York Festivals Grand Award for her radio documentary “The Cause of Thunder” at thirty, and rehab graduate at thirty-three. Carla has had lifelong struggles with mental health and addictions and is a testament of living recovery. Carla manages the hectic schedule of a single parent of three kids and three dogs in a funky historic home constantly under renovation. She is a wholehearted LGBTQ2 advocate and ally, having launched and successfully challenged governments in precedent-setting cases to support her transgender autistic teen, and has spoken about gender diversity and autism at many educational events. She can be found in PFLAG support circles, behind her camera lens, backpacking the world—with or without the children—or simply in her yard, trying desperately to grow azaleas. 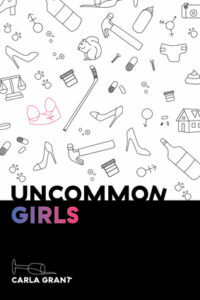 Uncommon Girls is being released in the coming weeks and will be great insight into the trials of a family supporting a transgender teen as they navigate the world around them. The family at the centre of the book are from a community in the Edmonton region and should be of interest to many Alberta families facing similar struggles.